Redefining what a preamp can do. The Black Box Analog Design MM-1 Vacuum Tube Preamp is an entirely new approach to capturing audio. It is not based on any existing circuit but designed from the ground up, using the best parts and ignoring all of the standard ideas of how a preamp “should work”. The result is an incredibly versatile piece of gear that not only sounds amazing but shatters the idea of what a preamp can do! On/Standby/Off positions. Standby mode sends power to the tube heaters and LEDs. Impedance is switched by tapping into the transformer at different points in the winding. Default (button out) is standard higher impedance input. Engaging the switch (button in) switches to lower input impedance for loading the microphone or for use with ribbon microphones. The Pentode gain control tilts the response depending on the “response” selection. In default mode (button out), the top end of the response is fixed and the response tilts around this fixed position. The lower the Pentode setting, the more low end is rolled off in a tilt. When response is engaged (button in), the top end is no longer fixed and the top end tilt moves the other way, rolling off more top end as the Pentode is decreased. “Air” engages the air circuit from the HG-2 (10k harmonic shelf). The MM-1 comes standard with a 3 db boost when air is engaged but the boost is internally adjustable. The triode stage has a linear frequency response and should be used as the drive stage. It can be used to cleanly amplify the response curve of the Pentode stage or driven into gentle saturation, hard saturation and eventually limiting. Plugging an instrument cable into the input automatically engages the DI and disconnects the microphone input. The signal path of the DI follows the same topology and controls as the microphone input, with the exception fo the input transformer. The output control is a passive output attenuation designed to allow you to drive the Triode stage as hard as you would like and still have the ability to trim the overall output back to your desired level. In the fully clockwise position, there is no attenuation. One of the best parts of my position at Vintage King is being able to try new preamps I would normally never get the chance to use. A few weeks ago I was introduced to the Black Box MM-1 and immediately became a huge fan. The MM-1 is a unique all-tube preamp with two gain stages and custom wound input and output transformers, allowing independent control of the Pentode and Triode stages and the ability to blend between the two. The potentiometers aren’t stepped, which allows the smallest tweaks on either side to drastically reshape the tone. This mic pre truly embraces the use of harmonic distortion, which when used in the right way is a key ingredient to making something sound rich and “analog.” Since I’ve been using so many mic pres that try to be as clean as possible, I became a fan of the MM-1 for having its own unique feel. With the ability to add such rich harmonic content through two different gain stages, this mic pre is completely different than anything I’ve used in a long time. Watch our new demo of the Black Box MM-1 below and continue on after to read more of Bryan Reilly’s thoughts on the mic pre. In my experience, the MM-1’s Pentode section provides the low end, darkness and power of the preamp. Then dialing in the Triode section will start to bring the signal to life, adding air and smooth higher mid frequencies. This really brings the sound to the front of the speakers. Once you find the perfect blend between the Pentode and Triode section, you can use the passive output dial to hit your DAW or tape machine with the ideal input level. In the Pentode section, you have the option of engaging the “Response” button. When the “Response” button is in the out position, the preamp has a wider frequency response that provides the rich low end and powerful midrange mentioned earlier. Engaging the “Response” button completely changes the sound of the preamp. In this mode, the sound is much darker with even more focused on the low end and lower midrange, shaving off a lot of information in the higher register. I didn’t end up using this setting on any examples in our demo video, but was getting some pleasantly dirty electric bass and explosive guitars tones when I was first messing around with the mic pre. The Triode section has the option of engaging the “Air” mode, which is the same circuit found in the Black Box HG-2. This mode does exactly what you think it does, as engaging it will excite the higher frequencies and add “Air” into the signal. You have to be pretty careful when using this mode and blending with the Pentode section, since boosting too much of the Triode section with the air circuit engaged can cause a piercing feedback loop. This happened to me a few times while getting to know the preamp, but once I got used to the sensitivity it was easy to dial in a sound without any feedback happening. In fact, I preferred the “Air” circuit to be engaged, so every example in the demo video has it on it. Another great feature of the MM-1 is the five-position high pass filter. All the way to the left is completely off, then you have the options to choose from 40, 80, 120 and 160 Hz. The roll off is very gentle and musical, as using the 40 or 80Hz options helps to clear out the mud on any source without removing the low end completely. Even 120 and 160Hz maintains some power in the low end. This was useful when recording the acoustic and electric guitar examples. The MM-1 gives you the option to switch the impedance at the input transformer. Some tube preamps that have switchable impedance on the input can be transparent or very subtle. This is not the case with the MM-1. On the acoustic and electric guitar examples, I used a Royer R-121 ribbon microphone, engaging the IMP switch helped add some extra gain and fill out the sound of the mic without having to rely on cranking the preamp. Although the mic sounded great without the IMP circuit, engaging it allowed the natural tone of the microphone to shine and took far less work to dial in the sound I was looking for. Moving forward in the blog, I’d like to share my thoughts and experience on how the Black Box MM-1 held up on a few different sources. For the acoustic guitar example, I used a Royer R-121 plugged directly into the Black Box MM-1 without any EQ or compression, that was then fed directly into a line input of a Universal Audio Apollo 8. I positioned the R-121 a couple inches away from the body somewhere between the sound hole and 12th fret. I had the IMP circuit engaged on the input and the high pass filter set at 40Hz. On the Triode section, I engaged the “Air” circuit to help pull out the string noise and percussive aspect of the performance. When trying to find my ideal sound, I first started by dialing in a tone that sounded great with the Pentode section. Afterward, I dialed in the Triode section as I thought it was needed. Once I got the initial tone, I thought I could be missing out on some color or alternate tone options I might get if I was sweeping both stages at the same time. I went back to the drawing board and started sweeping both sections up and down simultaneously until I landed on something that caught my ear, which ended up being completely different from the initial tone. 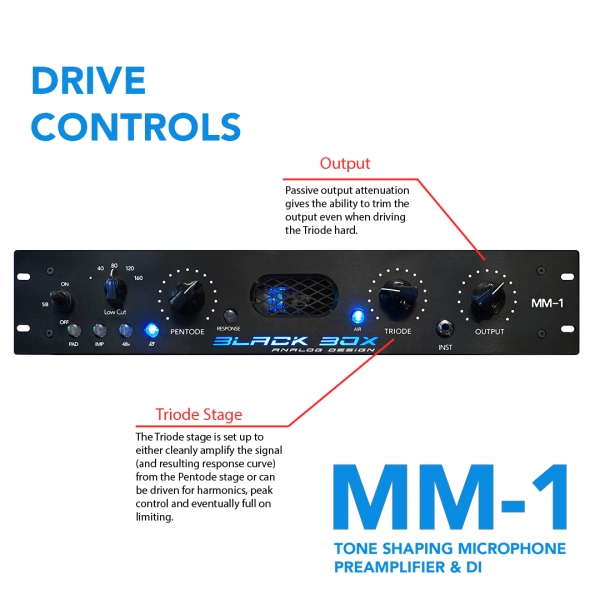 The beauty of the Black Box MM-1 is its ability to get multiple tones from one preamp without the use of outboard EQs or compression. In the acoustic example, I’m playing a soft fingerpicking progression I’ve been messing around with lately. As I mentioned earlier, there’s a point where you can’t push the Pentode and Triode sections any further without causing feedback. I had the output dial all the way up and a healthy amount of gain in both sections, but the low dynamic in the playing still ended up hitting the DAW with lower than the desired signal. The tone still sounded great, but the level would have to be made up within the DAW to make it stand up in a final mix. I think the quieter overall output level had something to do with a slight lack in the low end. There was also a capo up a few frets on the neck, which will raise the key signature and reduce low frequency. Without the 40Hz high pass filter, there was a little bit of rumble and hum because the pre was cranked so high, but the fact it’s so gentle wasn’t really reducing the key frequencies in the low end, so I choose to keep it engaged. I thought overall the tone was natural and pure, the playback sounded exactly like it did in the room and nothing was being exaggerated or lacking. The percussive aspect of the playing was bright and present without being harsh, the natural tone of the overtones and sustained notes came through crystal clear. I think the MM-1 is a winner for acoustic guitar. When it comes to electric guitar, a tube preamp has a great way of pulling out all the nuances in the signal while also adding a little bit of color to fill out the sound. Preamps such as the Universal Audio 610, Manley Voxbox and Tube-Tech CL-1B are some of my personal favorite tube preamps for electric guitar, but all of those preamps have their single signature sound. As I mentioned before, what sets the MM-1 apart from them is the ability to shape the tone in multiple ways, as well as add layers of harmonic content into the final signal that aren’t coming from the amplifier. I miked up my 1965 Ampeg Gemini One with the Royer R-121 directly into the MM-1 with no EQ or compression. I was playing my Telecaster through a JHS Colour Box followed by the Fulltone Supa Trem 2 with the tremolo mix all the way down, just using it as a boost. For the demo, I played a rock/blues style progression and most of the overdrive was coming from the amp itself. The Colour Box added a touch of saturation from the Neve style preamp circuit, the Supa Trem naturally adds a little bit of low end, but works as a great boost to hit the front of the amp harder. I dialed in the preamp similar to the acoustic setup, working both the Pentode and Triode sections at the same time. I landed on pushing the Pentode section pretty hot, then boosting the Triode section with the “Air” mode engaged as much as I could before feeding back. What was printed into Pro Tools was being colored quite a bit from the MM-1. This is a great example of how much harmonic distortion can be added. It didn’t completely change the sound, but brought out a whole new level of depth that wasn’t coming from the amp in the room. As soon as our video guy (Dustin McLaughlin), and I heard the playback in the room, we were blown away by how rockin’ the tone was. The MM-1 moved high up on my list of favorite electric guitar preamps from this single demo. Not only was the preamp adding some pleasant harmonic distortion, it was also working as an EQ (mostly coming from the “Air” section of the Triode section) that was bringing out the higher frequencies (similar to what an API 550a or 560 does for electric). The MM-1 will also slightly compress as you push the Pentode and Triode circuits. It’s not full on compression like an 1176 or LA-2A, more like “glue” that fills everything out. The compression helps the high frequencies from piercing through the speakers and tightens up the low end, ultimately making a tone that is full and even across the entire frequency spectrum. If you’re looking to add another tube preamp to the collection and work on a lot of electric guitar-based recordings, I highly recommended trying out the MM-1. It can be subtle and work as a “standard” preamp, or it can be pushed a bit to create endless tonal options. One of my favorite channels strips for electric bass is the Universal Audio 6176, especially with a passive P-Bass. The color in the tubes in the 610 preamp can make a straight DI signal sound as if it’s coming through an amp. The EQs are very musical, usually one click up on any frequency in the low band will help add a bit of thunder. The 1176 helps round out all the transients, increase the power of the lower frequencies and sustain the notes longer than they would probably ever need to be. It’s also extremely easy to use and nearly impossible to make it sound bad. After doing this demo, the MM-1 has also become one of my favorite electric bass preamps. I plugged straight into the front without an external DI or pedals. Within a minute or so, I had the tone dialed in. I just swept the Pentode and Triode sections together until it felt right. Once I found the sweet spot, I don’t think I would end up using EQ in a track with this tone. It naturally filled out all the low end. I ended up rolling the tone down about 40% on my P-Bass to cut back some of the string and finger noise, but I didn’t want to lose any bite if I dig in for a lick. The THD in the MM-1 did a great job at pulling out the “wood tone” of the instrument as I dug in a little bit. Even without a compressor in the signal chain, the Black Box was gluing everything together, close to what I’d be looking for from the 1176, LA-2A or LA-3A. One of my favorite qualities in the compression sound was in the attack. It has such a fast attack and release, it’s as if it’s not even there. The initial attack gets ducked then immediately releases to bring up the meat of the note. For not being an actual compressor, the Black Box is one of my new favorite compressors for DI bass. 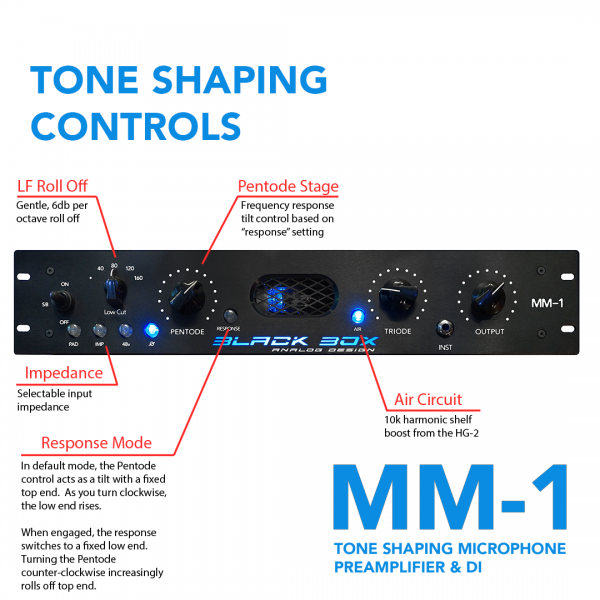 The Black Box MM-1 is priced at $1,749, which may seem steep for a single channel preamp, but as I mentioned throughout the blog, it’s not solely a preamp. It also has some EQ and compression qualities to it. If you already own a collection of nice outboard preamps and are still searching for something to add a new vibe or color to your recordings, this is the preamp for you. This would also be a great “one pre to rule them all” if you’re buying your first high-end pre. Until now, a preamp simply amplifed the signal; you essentially got one sound and the ability turn it up or down. The MM-1 on the other hand allows you to drastically shape the response curve of the unit without using an EQ, control the harmonic content from pristine to full on saturation and even control the dynamics without a compressor! All of the shaping is done at the tubes and from the constantly variable interaction between stages allowing you to dial in virtually unlimited tonal possibilities. You can find the sweet spot of any microphone and instrument easily and naturally. The response curve of the Pentode stage alone gives you a huge amount of control over the tone. Coupled with the independently controlled Triode stage you have virtually unlimited tones at your fingertips. There seems to be an obsession with THD when it comes to mic pre designs. Manufacturers boast about how “clean” their designs are and how low the THD is as if these harmonics are the plague yet the fastest growing trend in plug-in design is creating plug-ins that add back these harmonics! Tape, console, tube and various analog emulations that add pleasing harmonics and distortion are more in demand than ever! Why? Because the human ear LOVES harmonics! So why are manufacturers bragging about how they have managed to remove them from the design while mixers are having to add more emulations on to compensate? We have no idea but we certainly aren’t! We love harmonics and our pre has been designed to SOUND amazing! We give you the ability to add a ton of rich, beautiful and musical harmonics and give you unprecidented control over it! Our entirely analog audio circuit uses only tubes for amplification and is entirely free of op amps, ICs and transistors! From precisely, hand matched resistors and capacitors to custom wound transformers, every part is selected and built for the absolute highest quality sound. We all know that a piece of gear is only as good as its power supply! For that reason, our preamps use a massive toroidal to supply 350v of pure, linear power to get the most out of the tubes. Real power means real sound!